I really hope you watched/remember the hilarious and clever “Link to the Future” Fan Film we posted a few days back. It was a genius crossover between Zelda and Back to the Future, which kind of mocked the timeline.Well, now there’s a behind the scenes video, as well as an in-depth interview with the creators. Both are below. GameXplain: Combining Zelda with Back to the Future was brilliant. How did the idea for “Link to the Future” originate? Matt: From my recollection it resulted from chit-chat on set one day during some down time. Sean: Somehow started discussing the Zelda timeline theory. The idea to incorporate Doc Brown and Back to the Future came from the scene in Back to the Future part 2 where Doc is explaining the split timeline to Marty. We started joking that perhaps the only person who could legitimately explain the Zelda theory would be Doc Brown as well. Grant: We were talking about Zelda in the first place because I was dressed as Link for whatever reason. GameXplain: This isn’t your crew’s first video project, let alone your first videogame one. What is your team’s background in film, and what made you want to focus on gaming? Grant: I’ve always been a fan of videogames, Nintendo specifically, and I love making films. The two always seem to meet. There’s nothing more bizarre then seeing one of your favorite games play out in live-action. Matt: Gaming is awesome, movies we’ve been making for years. Sean: I am a recent graduate of the Ringling College of Art and Design Digital Film Program, with a concentration in Directing and Cinematography. I’ve made a few projects centered around games, because I feel like there is still so much untapped potential between them and film. I would love to make a “real” adaptation of a video game franchise, but until then, I’ve always enjoyed spoofing it. GameXplain: Grant, you mentioned before that you actually knew very little about Zelda before work began on the film. What had been your experience with the series up to this point, and what inspired you to make a video about it? Grant: I was familiar with the characters, but not the storylines that span the games. After watching the ending cut scenes of Ocarina of Time on YouTube however, it was very obvious how “Back to the Future” could be incorporated. I immediately began research on the games, and posted my awful first attempts at a timeline on Zelda forums. They were mad. Matt: For me though, I’ve been playing Zelda since I was like 6 or 7. GameXplain: How long did the entire project take and what was the most difficult part of the filmmaking process? Matt: It took like a month and a half from conception to shooting and then another like two or three weeks for editing and special fx, right? Sean: There was about a month of pre-production, but we filmed the live-action sequence in a day. Grant: The hard part was filming that day because it was hot as hell. In between takes I’d dump water on myself to “make it look like I was battling intensely.” That’s what I told the crew, I was really just hot. GameXplain: You guys wore many different hats during the making of the film. What were your favorite roles during the production and why? Grant: I’d have to say my favorite role was playing Link McFly. 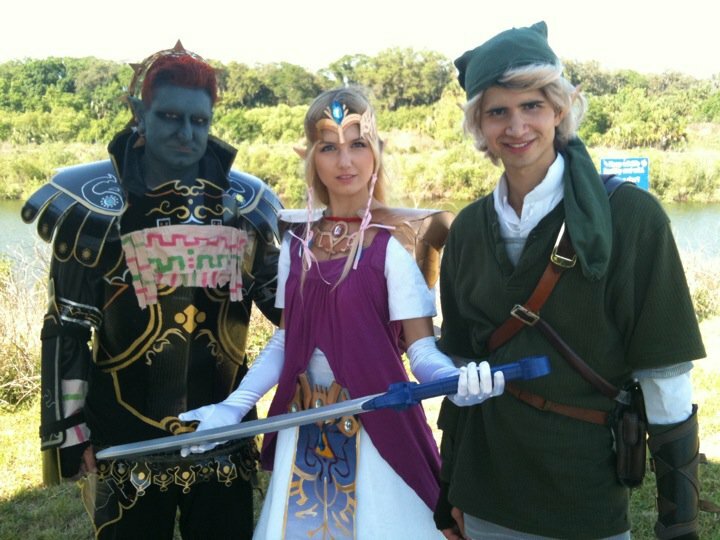 There aren’t many times you get to fight Ganondorf in real life. Matt: I thought you kinda rocked it on all fronts, dude. For me personally though, I loved it when we finally got out in the field and started shooting the film. Part of me could hardly believe it was happening. GameXplain: The battle between Link and Ganon adheres closely to the final battle from Ocarina of Time. Were any other scenarios considered, or was this planned from the beginning? Matt: That was selected for the opening pretty early. Certain liberties had to be taken for time/cost’s sake, though. Grant: Yeah, like we couldn’t film Ganondorf floating around a castle that crumbles to the ground, although we considered it. Sean: This was always planned to be the jumping off point because it’s strongly theorized that this is where the timeline splits into two. And it was awesome to film! GameXplain: The attention to detail is fantastic, whether it’s the costumes or special effects. Did you take many artistic liberties, or did you try and stay as faithful to the source material as possible? Grant: I guess the biggest liberty we took was using the Twilight Princess costumes for the characters since they are the most badass looking. Matt: The limitations of the liberties came down to plain old design sense. The Twilight Princess costumes were just better looking, but the Ocarina fight is the most iconic. So best of both worlds ultimately got combined. GameXplain: Of course, the crux of the video is Doc’s extensive and hilarious explanation timeline of the Zelda series. How much research went into figuring out the convoluted mess that is Zelda’s chronology? Matt: Grant went from being vaguely familiar with the series to a downright master of the various games’ timelines. Grant: I am the Hero of Internet. GameXplain: Now that you’ve seemingly figured it all out, what’s your impression of it? Are you happy with the timeline, or do you wish Nintendo had done some things differently? Sean: I’m personally very happy with the timeline, and the split timeline theory. I personally am a believer of the split theory, but there are infinite other possibilities. Grant: I’ll believe anything Doc tells me. Matt: That’s a debate for the Sages and Gods. GameXplain: Nick Tierce, who played Doc, really nailed the character. How did you find him, and what lead him to so perfectly capture the mannerisms of Doc Brown? Sean: Nick Tierce is a good friend of mine, who starred in my senior thesis film, LARP. While we were discussing making Link to the Future, I thought of Nick and knew that he would make an amazing Doc Brown, so I suggested him to Grant. Nick thought the idea was really funny and relished the chance to play Doctor Emmet Brown. He knows the character inside and out. Grant: And forwards and backwards. Through time. Matt: The man is a brilliant actor and his knowledge of cinema and gaming geek du jour is second to none. Grant: I watched the films and wrote down what Doc said, just replacing keywords, like “kids” with “decedents”. Voila, it practically writes itself. GameXplain: I recently spoke with Nintendo’s Dan Owsen, who helped localize Ocarina of Time. He confirmed to us that although Nintendo has an official chronological order for the series, they have no plans to make it public. What are your thoughts on this? Grant: You actually believed him? Sean: I like that Nintendo keeps it ambiguous, it makes for great debate among fans and I guess is the reason why we made our film. Matt: Or it holds the secret to like legit time travel. GameXplain: Did you draw inspiration from any previous Zelda fan-films, such as IGN’s 2008 April Fools joke, where they filmed a fake trailer for a Zelda movie? Matt: It was definitely discussed, but I feel like there was a kind of effort to distance us from the look of that particular film. Grant: I remember you guys showed me that video during preproduction for “Link to the Future”; it definitely raised the bar for us. GameXplain: Has your time involved with the film increased or renewed your interest in the series? Are you guys looking forward to Skyward Sword? Sean: I cannot wait for Skyward Sword! Any Zelda release is at the top of my gaming list. Matt: Cautiously optimistic (last game I played was Spirit Tracks and it was fun). GameXplain: Provided how much time you’ve spent in the Zelda universe, what are your favorite Zelda game and why? Sean: Ocarina of Time, hands down. Not only is it my favorite Zelda game, but it’s my favorite video game of all time. I grew up playing the NES and SNES games and loved them, but playing OoT was the first immersive experience in Hyrule. The story, the graphics, and the gameplay were all amazing and still holds up today without question. Matt: Ocarina of Time – Because I think this is one of the first games where you could make a legitimate case for video games as art. GameXplain: I can’t let you get away without asking…Back to the Future…1, 2, or 3? Sean: Back to the Future 1 holds a special place in my heart but the sequels are equally as good. Grant: I’d have to agree and say 1. It stands alone so well. GameXplain: Speaking of two, if you had to choose, would you rather visit Hyrule, or Back to the Future II’s 2015 Hill Valley? Sean: That’s a tough one but I would say Hyrule because the landscape is cooler. Matt: Hyrule, just because neon’s not really my scene. Grant: I’d have to say Hyrule as well, because I’m already planning on visiting Hill Valley in 4 years. GameXplain: Before we finish up, are there any other secrets or interesting facts that happened during the production that we should know about? Sean: We went to go get lunch at a nearby Supermarket and Grant and Edyta, dressed as Link and Zelda, walked up to the counter and ordered food. It was a very surreal experience to see Link and Zelda at a deli counter ordering sandwiches. I’m just glad that I was smart enough to take a photo of that. Grant: We actually had a DeLorean to our disposal, since a local car museum was going to let us use theirs, but halfway through the day we realized we wouldn’t have time to drive out there, so we decided to just green-screen a toy car into the footage. Matt: Turns out, you can’t even throw your sword into the ground dramatically anymore. I mean, what’s happening to this country? GameXplain: Finally, what’s next for you? Can we expect an update when the next Zelda comes out as the “To be continued” text jokingly suggests? Or should we be on the lookout for other videogame adaptations in the future? Grant: I am in the works of another live-action “Super Smash Tournament” right now. As for “Link to the Future Part II”, we had no plans for that, but I have a kickass idea for a trilogy… We’ll see. Matt: Not too sure what the future holds as of this moment, but I would love to make another video like this one with our crew.